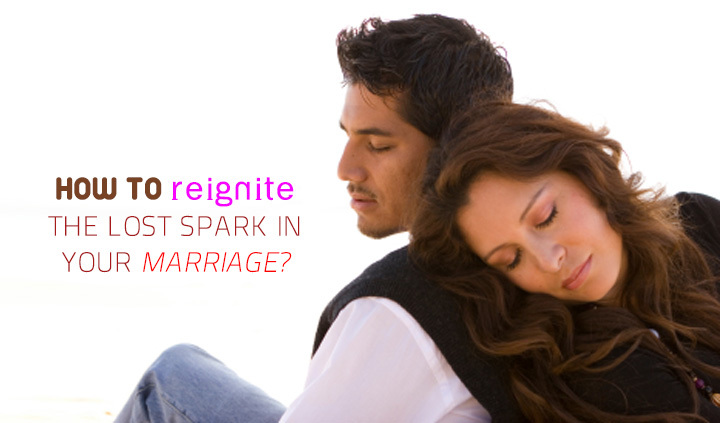 How to Reignite the Lost Spark in Your Marriage? Take a dream vacation: Saving up for your children’s college, or buying a house can put your dreams on the back-burner. But it is time to invest in your own relationship. So take off for an exotic holiday, just the two of you and whether you are backpacking or taking a luxury vacation, the time is now. Don’t stop fighting: It may sound weird but you only fight with someone you care about. So if you have stopped fighting, start the arguments again. Not only will it bring out a volley of unsaid things, you might use it as a conversation starter and then willing give up the argument. Plan a combined activity: Did you both loved to go clubbing, watch a movie or spend time gardening. Start doing that again.Small activities help you connect again so share a drink, plant your favorite flowers or go wild at the dance floor. Initiate pillow talk: It is so important to share a few cozy moments before you sleep and building up communication again is the first step to rekindling the lost spark. Just talk about what you did, catch up on your spouse’s activities and ensure that you not just talk, but listen too. With time, you’ll enhance the communication and the intimacy too. Don’t waste another minute and now as you know how to reignite the lost spark in your marriage and relationship .Sooner the better. Book your tickets or just go out on a dinner date!